I miss Bill Cunningham, although I didn’t know him personally. His photos and commentary in the New York Times were always so illuminating, kindhearted, and beautiful to see. I always hoped I’d run into him at 5th Avenue and 59th Street, but no such luck. This simple gray Calvin Klein dress (similar) stands up to the passage of time very well, especially with a thrifted bead necklace (sim), vintage cuff (from Citizen Rosebud’s shop) and blue suede sandals (sim). I bought the dress years ago for my nephew’s wedding and it’s still a favorite for when I want to go classic. Hair once again is the Paige by Paula Young. Tip for add-on hair wearers: pull a little of your own hair out at the front and the hairline looks more natural. But the outfit needed one more piece – a fab scarf I just bought at Bloomie’s (here, on a good sale). It’s silk and cashmere and the image is so delightful I couldn’t resist. Bill C is wearing his blue painter’s jacket and has his camera at the ready. The scarf is silk and cashmere, and feels wonderful. Even though you can’t see Bill now, I know he’s there, cheering on all women. I was so excited to see your beautiful face and hair pop up on Hat Attack Patti! Thank you for sharing! It’s a very classy outfit, Patti – ready for any Summer party! Love the necklace and the bracelet, and the scarf is simply wonderful! I feel the same about people who are gone… they are here with us, invisibly, I can feel their presence. Thank you for the link-up!! What a great dress…..and love the hair! What a beautiful dress. It looks so good on you. The right shape, the right length and a wonderful shoulder part. The Bill-scarf is delightful and such good material. It looks good on this dress. Just a little bit of a shame that it hides the beautiful shoulder part. Oooo, what a fabulous scarf!! I miss Bill too. It was weird being in New York last fall and knowing that I would never see him on the street again. That dress has a beautiful flattering shape – it looks so good on you. I have a very similar black Calvin Klein sheath dress, so I truly enjoyed seeing the way you have styled yours. The blue shoe and statement scarf are great additions. Happy 4th! Very classy Patti. 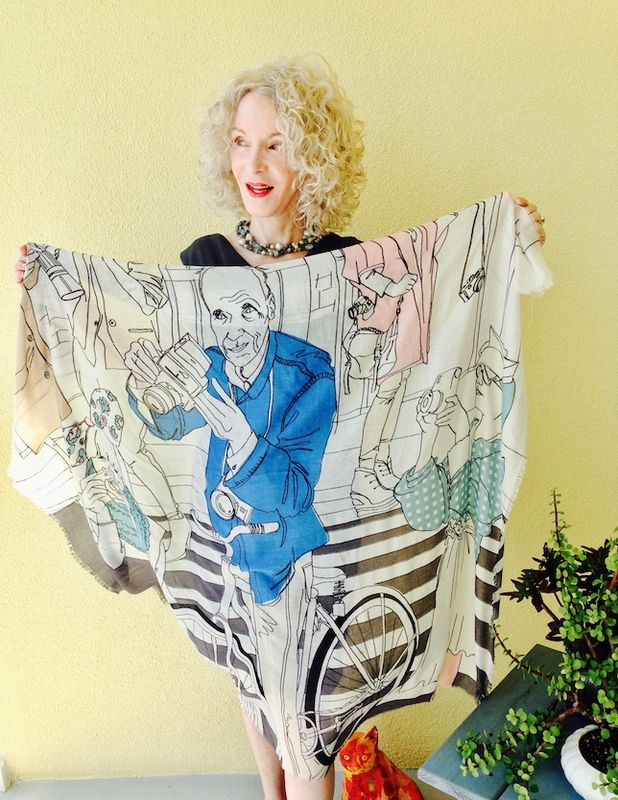 I love the Bill Cunningham scarf and thank you for posting! Bill was such a legend. That scarf looks amazing and fabulous on you!!! You look wonderful and the scarf was just the perfect cherry on top! What a tribute with that beautiful scarf! Your dress is so lovely, I love the way it drapes and fits you perfectly. Your hair is so full and fabulous, and I like the tip you gave! Have a Happy 4th of July Patti! Have a wonderful Fourth, Patti! LOVE that a scarf! What a find! Did you see the movie on Bill? It is very good. Love the classic dress. You are looking extra fabulous lately woman! Oh my oh my I too admired Bill and was very sad to hear of his passing! Thank you for sharing the scarf, luckily i am in the states right now and will see if I can get hold of one! Isn’t a black dress the perfect backdrop for so many things? 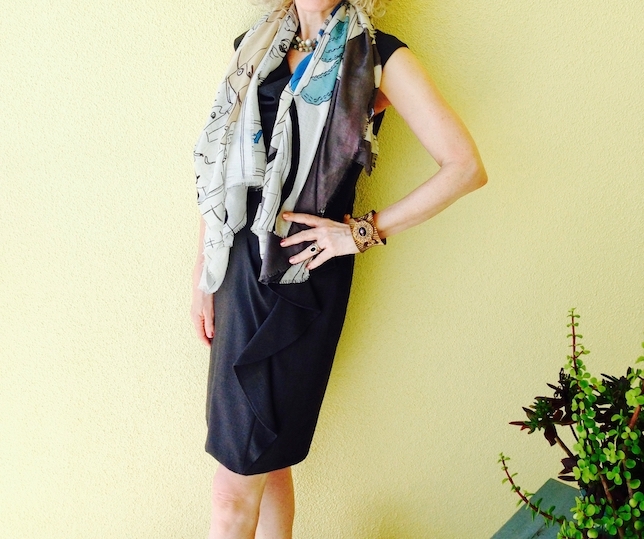 This fabulous scarf is one example…love it! Fabulous dress Patti and the hair is terrific! Beautiful scarf! It goes perfectly with your dress! Peace! Oh that scarf, Patti! I am in a literal swoon over it! What a fabulous piece. You look fantastic in your classic dress and that scarf is just the perfect finishing touch. A wonderful momento of a truly talented man- I so enjoyed his photographs and the stylish and original men and women he captured. Thank you for Visible Monday. Dearest Patti, so wonderful in black and blue. Happy week. Keeping in touch on Instagram. Wow! that scarf is utterly incredible. I’d hang that from the wall. I’d never heard of Bill Cunningham until I read Shelley’s blog. I’m hopeless, aren’t I? I love dresses like that and that scarf is fantastic! Unique! That is a truly beautiful scarf Patti….so unusual and unique. A fun and thought provoking scarf is a great way to spice up an outfit. I’m especially fond of the one of the muses from the Fashion Rainbow exhibit. You’re looking fabulous as always, Patti. Thanks for the inspirations and the link up. The scarf is fabulous! 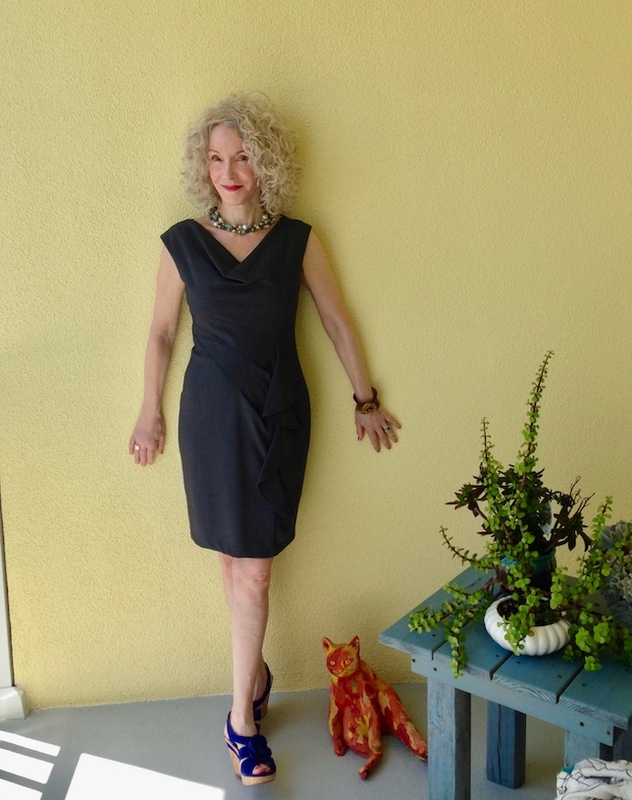 Looking very elegant and stylish in your little black dress Patti! That scarf is wonderful! I never met Bill Cunningham but a friend was photographed by him a few times. The dress is 100% classic. I love the expressions in your photos, Patti. And you look fabulous in that dress. Mr. Cunningham had a huge impact on my life, appearing right when I was at the cusp for change, starting blogging and picking myself up. I’m glad you have this reminder of him, and such a beautiful one. Thanks for hosting. Adore the scarf. Scarves were everywhere on European women when I was in Netherlands and Germany last week. What a lovely scarf. The entire outfit is fabulous! Thanks for the linkup & Happy 4th of July! What a wonderful tribute, Patti!! Gorgeous scarf!! Love the beaded necklace in the fab visible pieces! Ah, I miss him too. He got right to the core of NYC street trends. Maybe it’s time to watch his movie again. Classic is the word for this dress and you look simply elegant Patti! Happy 4th of July, we just celebrated Canada’s 150! That dress looks awesome on you and I love the scarf…and Bill Cunningham! Happy 4th, Patti!